The Euro stands at the back foot on Thursday after bulls were strongly rejected on Wednesday and the day ended in Doji with very long upper shadow. Another negative signal comes from pair's inability to register close above initial barrier at 1.1423 (Fibo 23.6% of 1.1815/1.1302/Fibo 38.2% of 1.1621/1.1302) which limited the action in past week, despite strong spikes higher. The greenback regains traction after initial negative impact from US midterm election, which keeps the single currency under pressure. 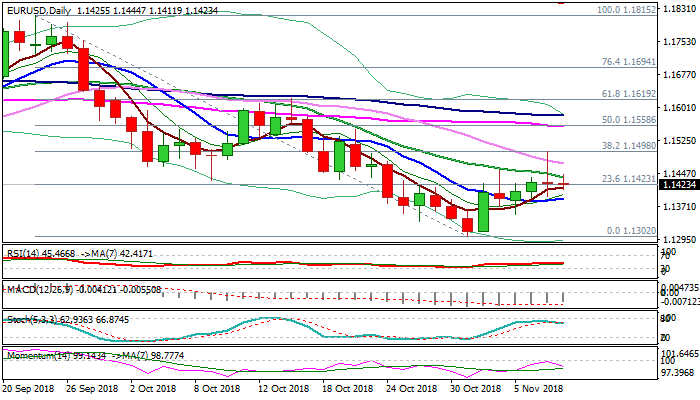 Hawkish tone from Fed after of two-day policy meeting would add to Euro's negative outlook, but near-term action is still underpinned by 10SMA (1.1390) and sustained break here is needed to signal reversal and re-expose key supports at 1.1300 zone.